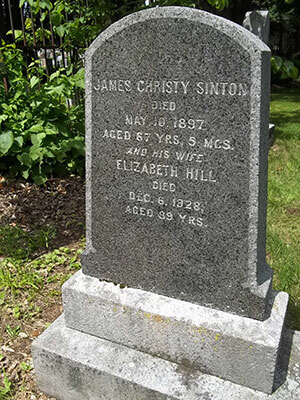 With the death of James, this branch of the Sinton family tree comes to an end. "died 10 May 1879. Was the only one of us who married. He had no children. His wife is still alive." AGED 67 YRS. 5 MOS. The location is Mount Royal Cemetery, Montréal, Québec Province, Canada.